There are currently no upcoming soccer listings scheduled on ESPNU. Are we missing any soccer listings for ESPNU? If so, please let us know. ESPNU is a sports channel available in the United States, part of the ESPN Network. Launched in 2005, this channel is available on all major TV carriers in the U.S., including Dish Network, DirecTV, Comcast, Cablevision and more. As its name indicates, this channel focuses its broadcasts on college sports, including football, soccer, basketball, volleyball and baseball, among many others. Added to its usual programming, ESPNU can be used by the network as an overflow channel when ESPN2 and ESPNews are unable to perform such duties. 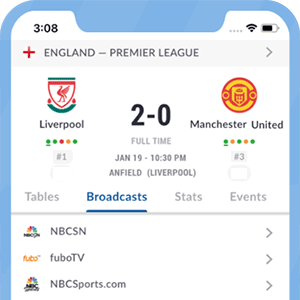 Football games in this channel might include matches from the International Champions Cup and the United Soccer League (USL). What channel is ESPNU on? This channel is also available on most cable TV providers in the U.S. Check local listings for availability.